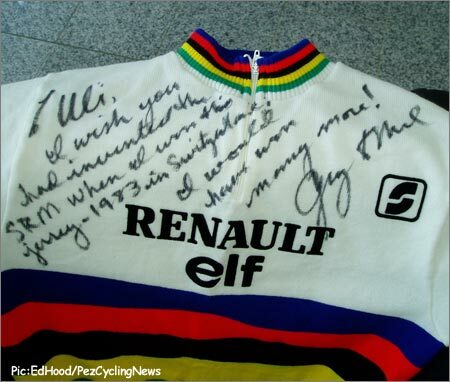 ‘I wish you had invented SRM when I won the jersey in 1983 in Switzerland, I would have won many more.’ The words of a certain Mr. Greg Lemond to Ulrich Schoberer, inventor of the SRM power crank, the words are in Greg’s own hand writing on a rainbow jersey gifted by the grateful American to ‘Uli’ as most people know him. In 1986 Uli was an engineering student who raced bicycles. As an engineer he was frustrated by the fact that it was very difficult to accurately measure his fitness and how it improved as his training progressed. He sat and thought about it and decided that the only measure that was reliable was power-output; because other measures like cadence, speed and heart beat could all be affected by variables such as wind direction, temperature and terrain. 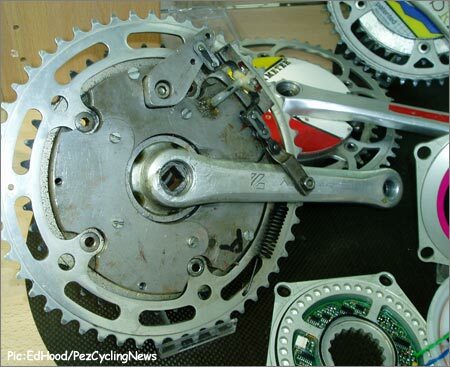 SRM produced their first version of their power-measuring cranks in 1986. The next step was to decide where and how to obtain the measure, he decided the best place was as close to the bottom bracket as possible, before frictional forces in the drive-train kicked-in and affected the readings. The SRM power crank has at its heart, strain gauges which are located at the junction between the right-hand crank and the chain rings. The first ever power crank set is on show at the SRM headquarters in Julich, Germany - it’s no thing of beauty, but it worked. Every part, mechanical and electrical, was made by Uli at university. 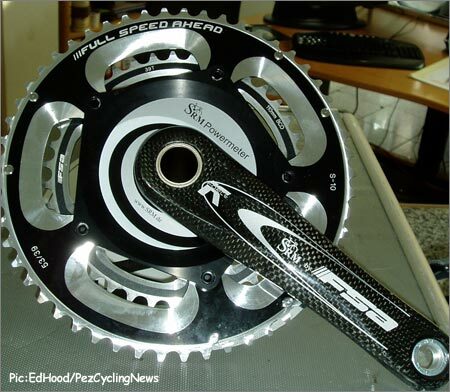 The evolution of SRM includes partnerships with top crank-makers like FSA. The product has encompassed virtually his entire working life, after university he only worked for one year, as a laboratory technician, before making the power-crank his vocation. Very early in the gestation of the product he realized the importance of having partners to work with, people who could make development suggestions and more importantly, recommend the product to others. Uli took his early prototype to the German Federation, they liked it and national squad riders were using the product as a training-aid very early in its life. The inside of the SRM bears witness to the advances of the computer age. The headquarters building is not just a hi-tech temple; it’s a shrine to satisfied clients and recent cycling history. Complete bicycles from the likes of Ivan Basso and Chris Boardman adorn the walls, with gifts and mementos from Mario Cipollini and Lance Armstrong, to name but two. Pez caught-up with Uli at the start of the stage from Obernai, Luxembourg to Valkenburg, Holland; nine riders – two each from T-Mobile, CSC, Quickstep, Gerolsteiner and one from Milram were being ‘wired-up’ by Uli and his technician. 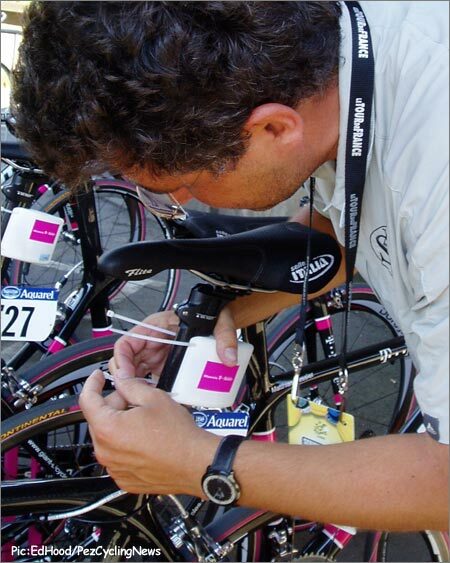 Uli attaches one of the transmitters to a T-Mobile bike for live data reporting during le Tour. A ‘sender’ is clipped onto the seat pillar and the rider’s SRM data is then relayed via the mobile phone network to the ARD and OLN television network, who can then display the data on screen during the stage. After the stage start we drove up to Julich to see the SRM operation and talk to Uli over a pizza and a wheat beer (Pez passed on the Schneiderweisse though). As we sat watching the stage develop, Jens Voigt’s ‘numbers’ flashed-up on to the TV screen, but only two pieces of data – power and speed. 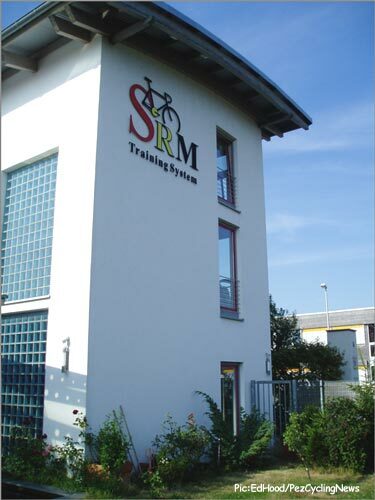 Behold a man who’s worked almost his entire post-grad life at one job – Ulrich Schoberer of SRM. Pez: When did you sell your first power cranks? Uli: 1988, Greg Lemond was one of my first customers. Pez: How many have you sold? Pez: I’ve heard that you have not had to get involved in sponsorship to grow the business. Uli: That’s right, the most we will ever do is to donate a free system. Pez: I’ve noticed that Shimano are producing cranks for you, what about Campagnolo? Uli: Most of the top-end crank manufactures work with us now – Shimano, FSA and Truvativ included, it’s only Campagnolo who have said that they are not interested. 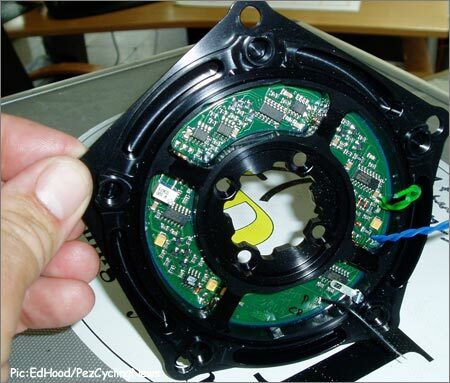 Apart from collaborations like the one with Shimano, every part of the system, including the electronics is made in Germany. Pez: How many staff do you have now? Uli: We have 20 in Germany and five in the US. I have made a point of growing the company very slowly. Amazingly – what amounts to almost the complete history of power measuring cranks still fits on one shelf. Pez: Who are your customers? Uli: Professionals, people who cycle for a hobby but who have money and people who like to look at numbers. Joking apart; people who want to train seriously. Pez: I see Lance gifted you a jersey, did you ever help him with training? 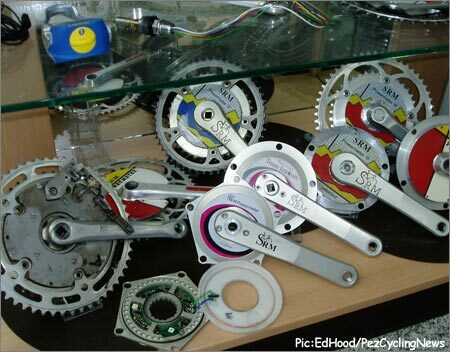 Uli: He used my product as a training-aid I have met him several times to help with the technical aspect of the cranks, but I have never made-up any programs for him. Pez: I’ve heard that it takes a while to learn how to interpret the data produced? Uli: No, not at all, the more watts the better, it’s as simple as that. Training on heart beats is fine, but it’s not an absolute, all sorts of things can raise your pulse, but watts are watts. An impressive endorsement from an impressive American. Pez: What about future developments for the product? Uli: We re looking at making the product lighter, we have already collaborated with FSA to produce a carbon crank, but I think we are getting to the stage now where it is difficult to shed any more weight. Pez: Do you envisage branching-out into other products? Uli: We developed power measuring systems fro trotting horses and wheel-chair racing but those markets aren’t big enough. We are accepted by the top riders and directors now so I think sales-growth will continue as more people discover the benefits of the system. It’s hard to argue with a man who has invented probably the best training-tool in the history of the sport, and thanks for the pizza Uli.